“Theo the Thirsty Elephant:tm” is a new portable and personal child’s drinking straw apparatus . “Theo the Thirsty Elephant:tm” is a trademark design for a new drinking straw apparatus. Theo the Thirsty Elephant:tm is comprised of a clear plastic toy in the shape of an elephant and weaving by way of a series of 1/4 inch holes within the toy, is a long flexible ¼ inch plastic straw that serpentines around and within the toy. One end of the straw is forms part of the elephant trunk [this is the end that is immersed in the drink]. The suction end of the straw exits the side of the elephant. [#1] Theo the Thirsty Elephant:tm is similar to a conventional drinking straw, in that one end of the straw is immersed in a drink and the other end is the mouth suction end. This trademark design applies to a personable drinking straw that is portable, light weight clear plastic and cost effective to manufacture. The trademark design of Theo the Thirsty Elephant:tm has one  new features added to a traditional drinking straw to improve novelty and particularly to help children finish drinking their milk, juice or water. The new design in which an exclusive property or privilege is claimed from a traditional drinking straw to the trade mark design, titled “ Theo the Thirsty Elephant:tm” are defined, in this paragraph [#1] and paragraph [#2 to #5]. [#2] A drinking straw as set forth in paragraphs[#1] wherein the drinking straw is intricate part of a childs toy that is in the shape of an elephant. [#3]A drinking straw as set forth in paragraphs[#1 & #2] wherein the drinking straw is designed so that the straw in-take is the end of the toy elephants trunk. A drinking straw as set forth in paragraphs[#1 &2 &3] wherein the drinking straw serpentines with in the toy elephant and exits the side of the toy elephant.The straw length can be changed, "3 or 4 straws fitted together" by way of [ clear plastic ,friction fit, coupling hose fittings ] and the straw design can be changed in a matter of minutes by way of using different weaving holes . A drinking straw as set forth in paragraphs[#1 &2&3&4] wherein the toy elephant is about 10 inches high and about 11 inches long and about 4 inches wide. This trademark design relates generally to a “drinking straw”, incorporated into a plastic toy at is portable light weight and inexpensive to manufacture. Theo the Thirsty Elephant:tm is designed to entertain children as they drink their juice or milk. Entertained and happy children, eat and in particular to this design drink better. trademark design. It is important, therefore, that the claim be regarded as including such equivalent constructions insofar as they do not depart from the spirit and scope of the present trademark design, titled “Theo the Thirsty Elephant:tm” . The purpose of the foregoing, is to enable the public, and practitioners in the art who are not familiar with new trademark designs, to determine quickly from a cursory inspection the nature and essence of the technical disclosure of the apparatus . The foregoing is intended to define the trademark design of the Theo the Thirsty Elephant:tm, which is measured by the claims, it is not intended to be limiting as to the scope of the trademark design in any way. It is therefore an object of Theo the Thirsty Elephant:tm to provide a new drinking straw design which has new advantages. It is another object of Theo the Thirsty Elephant:tm to provide a new drinking straw design which may be easily and efficiently manufactured and marketed. 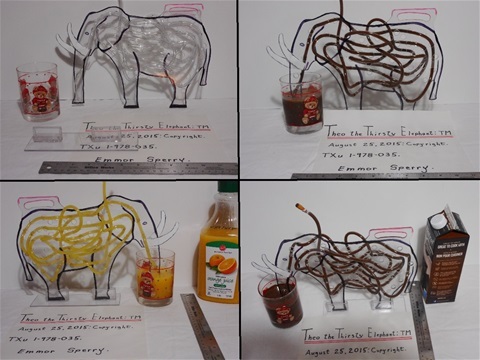 It is a further object of Theo the Thirsty Elephant:tm to provide a new drinking straw design which is of a durable and reliable construction. An even further object of Theo the Thirsty Elephant:tm is to provide a new drinking straw design which is susceptible of a low cost of manufacture with regard to both materials and labor, and which accordingly is then susceptible of low prices of sale to the consuming public, thereby making such straws economically available to the buying public. These together with the various features of novelty which characterize the trademark design, are pointed out in claims that are forming a part of this document. For a better understanding of the trade mark design, reference should be made to the drawings, pictures and descriptive matter in which there is illustrated preferred embodiments of the design. A picture of “Theo the Thirsty Elephant:tm” is part of the trademark design. Fig: 2 is the side view. Fig: 3 is the end view with drinking cup. With reference now to the picture/drawings, and in particular to FIGS. 1,2,3 & 4 thereof, a new air-conditioner design, titled “Theo the Thirsty Elephant:tm” embodying the principles and concepts of the present trademark design are. Theo the Thirsty Elephant:tm is for effecting a childs entertainment while drinking. As to the manner of usage and operation of the trademark design, the same should be apparent from the above disclosure and accordingly no further discussion relative to the manner of usage and operation of Theo the Thirsty Elephant:tm shall be provided. With respect to the above description then, it is to be realized that the optimum dimensional relationships for the parts of the trademark design , to include variations in size, materials, shape, form, assembly and use, are deemed readily apparent and obvious to one skilled in the art, and all equivalent relationships to those illustrated in the drawings and described in the document are intended to be encompassed by the present trademark design. The foregoing is considered as illustrative only of the principles of Theo the Thirsty Elephant:tm. Since numerous modifications and changes will readily occur to those skilled in the art, it is not desired to limit the trade mark design to the exact construction and operation shown and described, and accordingly, all suitable modifications and equivalents may be resorted to, falling within the scope of the trade mark design. Enclosed within and as part of this document is a picture of a working prototype of the trade mark design titled “Theo the Thirsty Elephant:tm”. Theo the Thirsty Elephant:tm: Copyright-August 25, 2015: by Emmor Ray Sperry. The distinctive design of " Theo the Thirsty Elephant:tm ", the word " Theo the Thirsty Elephant:tm " and the three dimensional trademark of Theo the Thirsty Elephant:tm are trademarks of Emmor Ray Sperry. The distinctive look is part of the trade mark design of Theo the Thirsty Elephant:tm. An exclusive copyright is claimed on the entire text, all drawings and sketches of “Theo the Thirsty Elephant:tm” that exist and the design, titled “Theo the Thirsty Elephant:tm”. Any infringement on this copyright or this trademark, in whole or in part, without permission in wrighting from Emmor Ray Sperry, is strictly prohibited. United States registered copyright number[ TXu 1-978-035 ]. American, Canadian and foreign patents are under acute consideration. “Welcome To Katie's Dollhouse:tm” is a new dollhouse toy. It snaps together almost like Lego. “Welcome To Katie's Dollhouse:tm” is a trademark design for a new dollhouse toy. Welcome To Katie's Dollhouse:tm is comprised of assembling instructions, 12 white ¼ inch cardboard or ¼ inch foam board dollhouse construction pieces, Decorative art and design stickers, One sticker for the owner to personalize the dollhouse with her name. of plastic or wood or cardboard. Most dollhouses are sold in stores. A problem with this is dollhouses take up a lot of shelf space. Consequently stores, especially the large department stores, only sell small plastic dollhouses. Specialty stores sell large plastic and wooden dollhouses. The wooden dollhouses are constructed or in kit form. Some of these dollhouses are 48 inches long by 24 inches wide by 30 or more inches high and cost up to one thousand dollars or more at today’s prices . "Welcome To Katie's Dollhouse:tm" design fits into a kit box that is 42 inches long by 21 inches wide by 4 inches thick. This takes up very little shelf space. They can be stacked on a shelf and the weight of the kit is very little, only about 2 pounds. The kit can be put together in 15 minutes or less by the child and one adult. 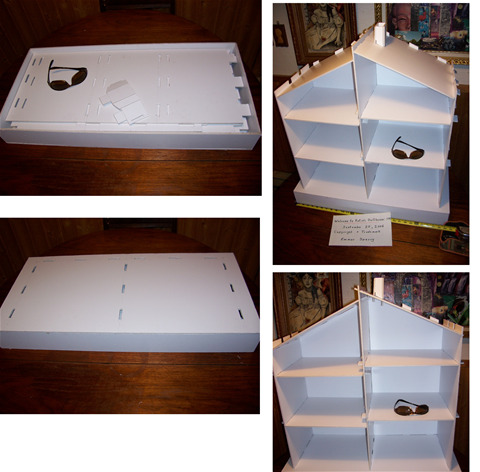 When constructed "Welcome To Katie's Dollhouse:tm"is 40 inches long by 18 inches wide and 42 inches high. A relatively large dollhouse. After an amount “of play time” with the dollhouse has passed, the dollhouse can be left constructed or disassembled and put back into the kit box. The retail cost of "Welcome To Katie’s Dollhouse:tm” would be within the price range of most people The new design construction pattern in which an exclusive property or privilege is claimed from a traditional dollhouse to the trademark design, titled “ Welcome To Katie's Dollhouse:tm” are defined, in this paragraph [#1] and paragraph [#2 to #6 ]. 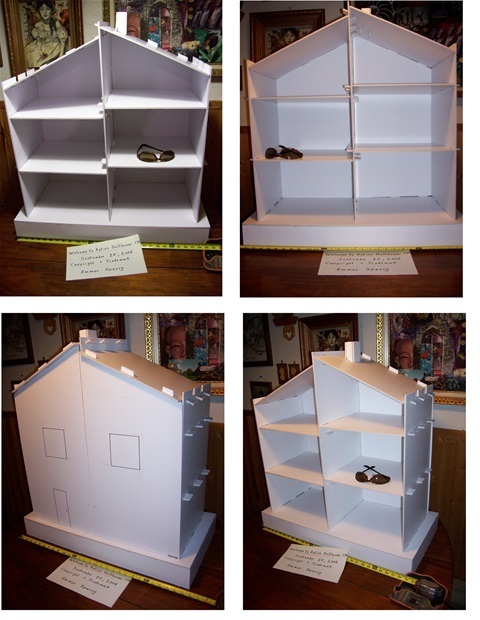 [#2] A dollhouseas set forth in paragraphs[#1] wherein the dollhouse is constructed , of 16 individual pieces of white ¼ inch thick cardboard ¼ inch foam board or [plastic] of different dimensions. All the cardboard pieces interlock with a tongue flap and rectangle hole connection. [#3]A dollhouse as set forth in paragraphs[#1 & #2] wherein the kit “container box bottom” is incorporated into the construction of the first floor of Welcome to Katie’s Dollhouse:tm” and is the foundation of the dollhouse. A dollhouse as set forth in paragraphs[#1 &2 &3] wherein supplied with the dollhouse kit is a book of stickers with pictures of Windows, doors, furniture, fire place, chimney, room art, stairs etc. A dollhouse as set forth in paragraphs[#1 &2&3&4] wherein The child that owns this dollhouse is able to personalize it, with her name on the dollhouse, with an enclosed sticker that is labeled with the words in 1 inch letters "WELCOME TO _________________ DOLLHOUSE". A dollhouse as set forth in paragraphs[#1 &2 &3 &4&5] wherein the cardboard pieces interlock with a tongue flap and rectangle hole connection from the dollhouse to the box foundation of the house are secured with a spring metal or plastic clip. This trademark design relates generally to a “Traditional dollhouse”, and particularly to a light weight and inexpensive to manufacture and easy to construct dollhouse. Welcome To Katie's Dollhouse:tm is designed to entertain children and is an easy to store toy. The exterior of the dollhouse is decorated with black and white line drawings, that can be colored by the owner with paints or crayons. The black and white art can be of flowers, trees, or animals with themes of Christmas, Halloween or Birthday, etc. Dollhouses are toy houses that have been around for about 300 years. In most countries, kids of all ages love them. However, adults too have been attracted by these toys. While children like to play with dollhouses, adults like to collect them as showpieces or decorative items. Toy dollhouses houses have been in museums Worldwide. Bavarian, Duke Albert built the first dollhouse in the 16th century. After that, they became very popular up to the present day. In the 18th century, most first-rated dollhouses were created by Germany. After the Second World War, factories in different countries started mass production of dollhouses, though finer craftsmanship details of the past were overlooked due to such large scale production. Easy to disassemble and store. Dollhouse is personalized for the child owner. Disadvantages of Welcome To Katie's Dollhouse:tm. Do to the construction material being cardboard, damage and brakeage is easier than plastic or wood construction material. There has thus been outlined, the more important features of Welcome To Katie's Dollhouse:tm in order that the detailed description thereof may be better understood, and in order that the present contribution to the art may be better appreciated. There are, of course, additional features of Welcome To Katie's Dollhouse:tm that will form the subject matter of the claim appended hereto. Those skilled in the art will appreciate that the conception, upon which this disclosure is based, may readily be utilized as a basis for the designing of other structures, methods and systems for carrying out the several purposes of the present trademark design. It is important, therefore, that the claim be regarded as including such equivalent constructions insofar as they do not depart from the spirit and scope of the present trademark design, titled “Welcome To Katie's Dollhouse:tm”. The purpose of the foregoing, is to enable the public, and practitioners in the art who are not familiar with new trademark designs, to determine quickly from a cursory inspection the nature and essence of the technical disclosure of the design . The foregoing is intended to define the trademark design of the Welcome To Katie's Dollhouse:tm, which is measured by the claims, it is not intended to be limiting as to the scope of the trademark design in any way. It is therefore an object of Welcome To Katie's Dollhouse:tm to provide a new dollhouse design which has new and improved advantages. It is another object of Welcome To Katie's Dollhouse:tm to provide a new dollhouse design which may be easily and efficiently manufactured and marketed. An even further object of Welcome To Katie's Dollhouse:tm is to provide a dollhouse design which is susceptible of a low cost of manufacture with regard to both materials and labor, and which accordingly is then susceptible of low prices of sale to the consuming public, thereby making such a dollhouse economically available to the buying public. Another object of Welcome To Katie's Dollhouse:tm is to provide a dollhouse wherein the same is formed as an entertainment system that increases the effective manner of construction and storage situations. Fig: 1-Front view of dollhouse. Fig: 2-Back view of dollhouse. Fig: 3-Perspective view of dollhouse. Fig: 4-Picture of prototype of dollouse. With reference now to the picture/drawings, and in particular to FIGS. 1,2,3 & 4 thereof, a new dollhouse design, titled “Welcome To Katie's Dollhouse:tm” embodying the principles and concepts of the present trademark design are. Welcome To Katie's Dollhouse:tm is for effecting an increased ease of construction and storage situations. As to the manner of usage and operation of the trademark design, the same should be apparent from the above disclosure and accordingly no further discussion relative to the manner of usage of Welcome To Katie's Dollhouse:tm shall be provided. The foregoing is considered as illustrative only of the principles of Welcome To Katie's Dollhouse:tm. Since numerous modifications and changes will readily occur to those skilled in the art, it is not desired to limit the trade mark design to the exact construction and size shown and described, and accordingly, all suitable modifications and equivalents may be resorted to, falling within the scope of the trademark design. Enclosed within and as part of this document is a picture of a working prototype of the trade mark design titled “Welcome To Katie's Dollhouse:tm”. Welcome To Katie's Dollhouse:tm: Copyright-September 20, 2006: by Emmor Ray Sperry. The distinctive design of " Welcome To Katie's Dollhouse:tm ", the words " Welcome To Katie's Dollhouse:tm " are trademarks of Emmor Ray Sperry. The distinctive design construction pattern part of the trademark design of Welcome To Katie's Dollhouse:tm. An exclusive copyright is claimed on the entire text, all drawings, sketches and patterns of “Welcome To Katie's Dollhouse:tm” that exist and the design, titled “Welcome To Katie's Dollhouse:tm”. Any infringement on this copyright or this trademark, in whole or in part, without permission in wrighting from Emmor Ray Sperry, is strictly prohibited. The United States registered copyright number is [TXu 1320096]. American, Canadian and foreign patents are under acute consideration.